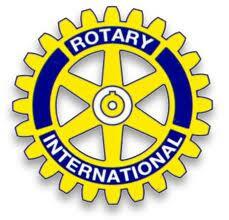 Due to the uncertainly of the weather for today, including the possibility of the loss of power, the Rotary Club of the Bridgewaters is postponing its annual Citizen of the Year event until a date to be announced. We apologize for any inconvenience that this may cause you. If you have any questions or concerns, please do not hesitate to contact me by email or phone. There will be crafts, baked goods, Victorian Tea Room, Grandma's Attic, raffles, door prizes, and a food court. Free admission!! 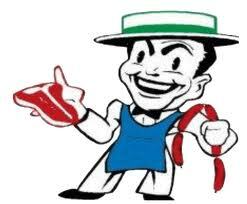 Please join Cub Scout Pack 35 at a Meat Raffle on Saturday, October 27, 2012 from 1 - 3 p.m. at the Bridgewater Knights of Columbus Hall, 582 Bedford St. (Rte 18/28), behind the Armory Building. Cost per ticket: $3.00 for 2 tickets or $9.00 for 5 tickets. There are 8 meat packages and two 50/50 cash raffles. Drinks / soda / hot dogs are available for sale. 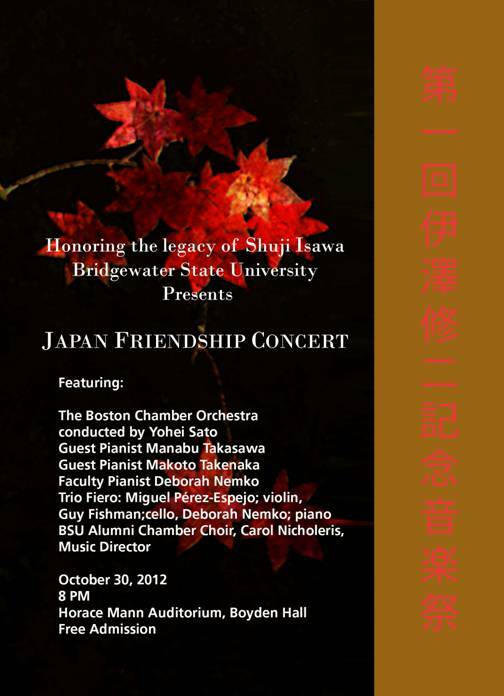 Please see the invitation below for a "Japan Friendship Piano and Chamber Concert" honoring the legacy of Shuji Isawa, Class of 1877. Isawa is regarded as the father of public education in his native Japan. Tickets are not required for this event it is free and open to the public. Pass the word along! Please join us in celebrating Shuji Isawa on Tuesday, October 30, at 8:00pm in Horace Mann Auditorium in Boyden Hall. For the thirteenth time the Rotary Club of the Bridgewaters will be honoring Citizens of the Year for the Bridgewaters at a ceremony at Bridgewater State University on Tuesday, October 30th at 7 P.M. Tickets can be obtained by contacting event chair Bruce Marquis at 508-378--7890. Joanne T. Hall, who, although proudly calling herself a “stay at home mother,” has spearheaded the West Bridgewater Neighbor Brigade since in inception in 2010. She is considered the founder of the local chapter of this critical program that employs 100 volunteers to help residents affected by serious illness, catastrophic injury, or other crises, with non-medical day-to-day tasks such as delivering meals, providing transportation to and from medical appointments and running errands. Emphasizing that the mission of the Neighbor Brigade is temporary crisis assistance, Joanne Hall has assisted with the creation of Neighbor Brigades for Bridgewater and East Bridgewater and she has also been active in he MOM’s Club of East and West Bridgewater. Joanne is currently pursuing a degree in nursing at Massasoit Community College; she had previously been awarded a Bachelor of Science degree in Management Science from Bridgewater State College (now University) in 2003. Born in Boston to Peter and Maria Tassiopoulos, Joanne Hall has a sister Angelica. She grew up in Braintree and graduated from Braintree High School, where she met her future husband Steven Hall, a brother of one of her close friends, and to whom she has been married for 11 years. They have two children, Katharine and William. A member of Saint Catherine’s Greek Orthodox Church in Brockton, Joanne is fluent in Greek and proficient in Spanish. Her hobbies are crafts, especially knitting, and community service. Professionally she was a Market Research Analyst for ComputerBoards, Inc. of Middleboro from 1995-1999 and then moved on to Partners Healthcare System from 1999 to 2005, where she served as a Marketing Administrative Coordinator and the a Marketing Project Manager. Major parts of her responsibilities there were preparing sophisticated PowerPoint presentations for senior management and managing a wide range of print, on-line and other projects to support the strategic initiatives of senior management and member institutions. Then from 2005 to 2007 Mrs. Hall was a Virtual Tour Photographer for the MLS Property Network based in Shrewsbury, Massachusetts. The Rotary Club of the Bridgewaters is proud to honor Joanne as its 2012 Citizen of the Year for West Bridgewater. When the Boy Scouts of America celebrated its 100th anniversary in 2010 Jack Julius of East Bridgewater was marking 50 years as a scout leader of the Town’s Troop 32. That same year Mr. Julius served as the Parade Marshall for Kiwanis’ Christmas on the Common. He became involved as a scout leader in 1959 and took over as Scout Master a few years later, serving for forty years in that role. Jack received the Silver Beaver award from the scouts for distinguished service to youth in 1978 from the Old Colony Council (formerly the Squanto Council) of the Boys Scouts of America. Jack Julius is also well known as having been the first Christmas on the Common Santa Claus, not having to wear one of those fake beards that come off when the kids pull it! A veteran of the World War II, Jack moved to East Bridgewater in 1952 with his wife, Ruth, whom he had married in 1945 while still in the nation’s service. They raised five children in town (Randy, Glen, Dale, Lisa and Barry), and now have 10 grandchildren and 10 great grandchildren. Randy and Dale lead the famous “Dale & The Duds” music group. Ruthie passed away in 2005 after 60 years of marriage and a large and wonderful family. Jack coached youth baseball and was later instrumental in encouraging equal opportunities for girls to play youth and school sports. Serving from 1944 to 1950 in the U.S. Army Air Corps and later the U.S. Air Force, Jack Julius started in the Army Air Corps Cadet program gunnery school for B-17s and B-25, then served out as a aerial gunner on B-29s, and finally progressed to being a photographer, flying over atomic test sites in the Pacific, including the Bikini Atoll, to document the results. Mr. Julius also served in the Crossroads Project, an air photo unit out of Roswell, New Mexico and he has intimate knowledge of the “happenings” there. Jack has maintained a strong interest in the history of World War II and often commiserates with Police Chief John Cowan (Rotary’s 2011 Citizen of the Year for East Bridgewater) about his memorabilia of the conflict. Jack Julius was born to Oscar and Esther Julius, growing up in Stoughton, Massachusetts with his sister Edith. He earned his earned his private pilots license with the help of the G.I. bill. In business Mr. Julius leased the Tydol-Shell gas station in Bridgewater to get into auto mechanics. In 1960 he founded “Jack’s Service” in West Bridgewater, which is still operating where he continues to “tinker around” with antique cars and others. His mantra is “to learn to get along with other people ad to respect others,” a similar approach to Rotary’s Four Way Test. The Rotary Club of the Bridgewaters is honored to call Jack Julius its 2012 Citizen of the Year from East Bridgewater. During her 35 years of membership in the association Ms. Krasinski’s goal has been “to have a viable, attractive downtown center that welcomes visitors, students and the other citizens of Bridgewater.” Key successes of that end has been the planting of trees on the town’s main thoroughfare, the maintenance of the Town Common and the Academy Building lawn, as well as plantings in front of the public library, the police station and at the islands on North and Pleasant Streets and near the Scotland intersection off of Pleasant Street. Also, for the past two years, Shirley Krasinski has chaired the University-Town 2020 Committee’s sub-committee on downtown revitalization. Previously, she was selected by the Town Manager to serve with a select group as the Town’s Transition Committee upon formation the new town government. Born in Stafford Springs, Connecticut to Ada and Philip Krasinski and growing up in nearby Somers with her sister Dorothy and brother Robert, Ms. Krasinski graduated from Rockville Regional High School. She went on to the University of Connecticut, where earned a Bachelor of Science degree in physical education, and then was awarded a Master’s degree in physical education from the University of Massachusetts at Amherst. Shirley coached high school field hockey, basketball and softball in Westbrook, CT before coming to the faculty of then Bridgewater State College (now University) in 1964. Her specialty at the college was teaching movement for children to teachers-in-training. She served for six years as Treasurer of the Massachusetts State College Teachers Association. One of Ms. Krasinski’s ongoing community commitments is serving as a Trustee of The Shey Children’s Endowment & Trust Fund. The Rotary Club of the Bridgewaters is very much pleased to recognize Shirley Krasinksi as the 2012 Citizen of the Year for Bridgewater. Bridgewater, MA – Central Square Congregational Church, UCC, 71 Central Square, Bridgewater, has announced that its annual Fall fair, this year themed “Winter Wonderland,” will be held Friday, November 2 from 6:30pm-8:30pm and Saturday, November 3 from 9:00am-2:00pm, with a full turkey dinner following with two seatings, 5:00pm and 6:30pm. People may buy their turkey dinners and take them home with the popular take-out option. Perfect for families with kids, students, those that are less mobile, or anybody who just wants a home-cooked meal without the cooking. With generous portions of homemade turkey, side dishes, and dessert, it’s a great value for a great cause. The fair itself boasts shopping and food as its main activities. Visitors will find a variety of homemade pies, baked goods, and candy (including homemade fudge!) available for purchase. There will also be their famous “cookie walk” – purchase an empty container, then make your way through tables filled with homemade cookies and treats and fill your container with the ones you like best. One price, as many cookies as will fit in your container! There will also be silent auction gift baskets, homemade craft and gift items, holiday decorations, jewelry, and “attic treasures.” Leave your young ones in the supervised children’s room while you shop, where there will be games, activities, and fun food. NEW THIS YEAR: Storyteller at 11am – free! For those that like to eat, there are plenty of opportunities as well. Friday evening, enjoy a piece of homemade pie and a cup of coffee. On Saturday, plan your day around the luncheon treats of Chef Beth Basler: homemade soup and chowder; specialty salads; sandwiches; and this year for the first time, “walking tacos”! What is a walking taco? Take a bag of chips of your choice (choose from various flavors of Doritos and Fritos), then add any taco ingredients you like… seasoned meat, cheese, tomatoes, sour cream, lettuce, salsa… right into the bag. Grab a spoon, and dig in! All the flavorful goodness of tacos without the mess! Then, in the evening, visitors should plan on attending the turkey dinner, either at 5:00 or 6:30, or order it to take home. Ticket prices for the turkey supper are $10 for adults, $8 for seniors/students, $5 for children under 12, and $30 for a family of 4 or more (up to two adults and their children). Supper includes home-cooked turkey and all the trimmings, side dishes, dessert, and a beverage (eat-in only). Advance reservations, for either dine-in or take-out, are recommended. Call 508-697-6016. Dinner tickets may also be purchased during the fair hours earlier that day. 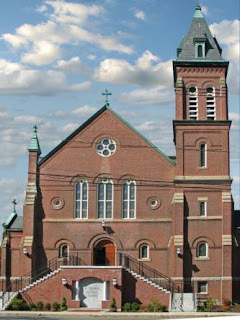 100% of proceeds from the fair benefit Central Square Congregational Church. CSCC (United Church of Christ) is a Christian community of people who are reaching out to their neighbors, at home and abroad, sharing their faith and their resources. CSCC is active in such activities as youth mission trips, weekly Sunday school, CROP Walk to fight hunger, Bridgewater Food Pantry, cub scouts, Fair Trade/Equal Exchange coffee and other products, Mainspring House, and Warmth In Cold Places. For more information, contact the Central Square Congregational Church office at 508-697-6016, or visit www.csccuccbridgewaterma.org, or email at csccuccoffice@verizon.net. 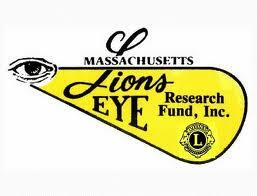 The Bridgewater Academy Lions Club will hold their 20th Annual TV Auction to benefit Massachusetts Lions Eye Research Fund, Inc. in a live broadcast from Bridgewater’s BTV9 cable station on Sunday, October 28 between 5:00 p.m. and 10:30 p.m.
Viewers can bid by phone on items as they are shown and described on the TV. Different bid boards are featured each hour, with special items open for bidding throughout the evening. Do your gift and holiday shopping from your easy chair as the various bid boards present jewelry, sports activities and memorabilia, vintage glass, gift baskets, new and collectible games, gift certificates and gift cards for shopping, dining and entertainment, health, beauty & fitness, automotive services, sports, landscaping and home improvement. 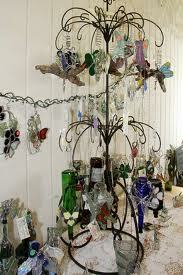 Decorate your home with handsome accessories, beautiful hand-made afghans, and other lovely hand-crafted items. This is the place for the interesting and the unusual, including a certificate for a Police Department Ride-Along and a certificate for a 1-Hour Experience as a Live Radio DJ. Bid high and bid often on more than 150 items. To receive an advance peek email with an updated list of auction items including donors and sponsors before Noon on Auction Day, Sunday, Oct. 28, e-mail your request for “ITEM LIST” to auction@bridgewateracademylions.org along with your name, preferred email address, and contact telephone number. If you do not receive BTV9 on cable, you may use the auction email address above to leave your maximum bid offer on an item by 2:00 PM on Sunday, October 28. Put "AUCTION BID" in the subject line. In your message, put your name and describe the item, board square number if shown, and amount of your maximum bid. Lions staff will do their best to get your bid placed for you. This annual event combines great shopping with the opportunity to help prevent blindness. Every dollar from bids realized by Bridgewater Academy Lions will be sent to Mass. 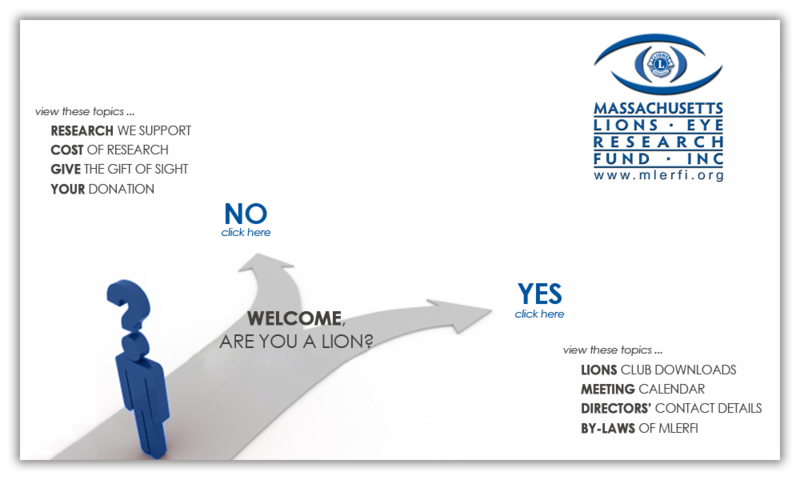 Lions Eye Research Fund, Inc., a tax exempt non-profit fund which provides research grants to determine the cause of eye diseases and to eventually find the cures. Over the past 19 years, this auction event has raised more than $189,000.00 in total for eye research. To bring that total over $200,000 for the 20 years, the Bridgewater Academy Lions are hoping to raise $11,000.00 this year, with strong community participation to help them reach their goal. Pioneers in their crafts, W.S. Gilbert and Arthur Sullivan are regarded as one of the greatest comic and musical writing teams in history! Gilbert's talent of wordplay weaving fantasy with reality and Sullivan's unparalleled flair marrying music and text, brought this show it's many performances around the world. Gilbert & Sullivan emphasis on wit, irony, and poking fun at the establishment from within managed to be both disrespectful of authority and at the same time get easily comfortable and urbane. This operetta, The Pirates of Penzance (or The Slave of Duty), is about a young man named Frederick, the son of a wealthy 19th century man who wants to be apprenticed as a pilot, but due to a hard-of-hearing nursery maid, was instead indentured to a band pirates! 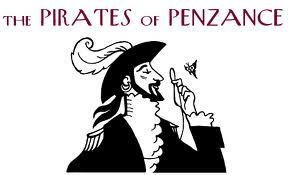 Not just any pirates, but the not-so-fierce "Pirates of Penzance." After twenty-one years, his indentures conclude and Frederick's sense of duty calls him to rid the seas of these rather simple ruffians. Featuring classic songs such as "I am a Pirate King," "With Cat-Like Tread," and "I am the Very Model of a Modern Major-General," The Pirates of Penzance is sure to charm the ear and tickle the funny bone! This timeless operetta planted the seeds for modern musical theater, Monty Python, Looney Tunes, The Simpsons, and countless others! Don't miss out on this "glorious thing!" Call the Box Office at 508-531-1321 or email BoxOfficeVM@bridgew.edu for Further Information and Reservations. All reservations are released 15 minutes prior to curtain. The St. Thomas Aquinas Women's Club will hold their Fall Rummage Sale on Saturday, October 27th from 9:00am to 4:00pm at the Parish Center on Center Street in Bridgewater. There will be clothing, shoes, domestics, jewelry, books, bric-a-brac, small furniture and more. The buck-a-bag will begin at 2:00pm. Something for everyone! Around the Common would like to support The Bridge Center. We will donate any proceeds from the sale of our BWTR oval sticker to The Bridge Center. The Bridgewater-Raynham Special Education Parents Advisory Council (BR-SEPAC) will be holding a meeting for the 2012-2013 school year on Monday, November 19th at 6:30 pm. At 7 pm Shonda Schilling, wife of retired Boston Red Sox Curt Schilling, will speak about her life experiences and her family's journey, including raising a child with Asperger's Syndrome. Her book, The Best Kind of Different, will be sold at the lecture. The meeting will be held at the Bridgewater-Raynham High School Lecture Hall (second floor) located at 415 Center Street, Bridgewater, MA. The BR-SEPAC is made up of parents that represent about 850 children with special needs within the Bridgewater-Raynham School district. Judy Bernstein will present a program at the Bridgewater Public Library on Tuesday, October 23rd at 7:00 p.m. Her topic will be: A Funny Thing Happened on the Way to the White House: A Celebration of Political Humor in America. Ms. Bernstein has collected dozens of stories and anecdotes revealing the wit and wisdom of our political history. This is a look at the light-hearted side of American politics. Judy Bernstein is a graduate of New York University School of Dramatic Art, and she holds a Masters Degree in Oral Communication. She has performed on radio and television in New York City and has taught at the college level. She now tours with her one-woman historical dramas. Wed., Oct. 17 from 5:00 -7:00 p.m First Parish Unitarian Universalist Church at 50 School Street, Bridgewater, will host the GLBTA (Gay, Lesbian, Bisexual, and Transgender Association) staff and students from Bridgewater State University in an observance of National Coming Out Day. As a Welcoming Congregation, we are pleased to have this opportunity to welcome members of the GLBTA community and their allies for an evening of social interaction. 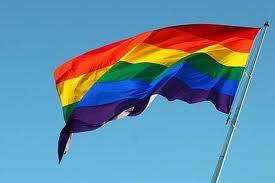 Lisa Forest, director of the GLBTA Office at BSU, will be joining Rev. Anita Farber-Robertson, minister of the First Parish Unitarian Universalist Church in Bridgewater as hosts. 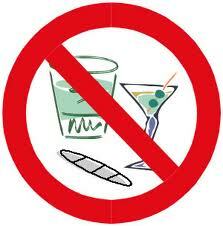 Substance abuse is closer than you think and so are the resources for recognition, treatment and prevention. Join the Bridgewater Coalition Against Community Violence for an information discussion on this important topic. Location: Dunn Conference Suite, Crimson Hall at Bridgewater State University. Parking is available in the Moakley Lot on Burrill Avenue. Light refreshments will be served. This is a free event and open to the public. 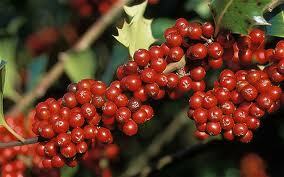 Celebrate Fall at the Bridgewater Senior Center's Autumn Celebration! This will be a special gathering with a catered lunch followed by entertainment by Gary Leanues. The event is for Bridgewater seniors only. Seating is limited. Please stop by The Office of Elder Affairs to purchase your ticket. 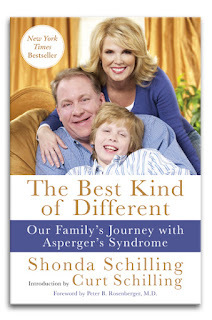 Shonda Schilling, wife of retired Boston Red Sox All-Star Curt Schilling, mother of four, including a child with Asperger’s Syndrome, New York Times Best Selling author, skin cancer survivor and dynamic motivational speaker. Her life experiences, her family’s journey and her willingness to candidly share the personal moments with the public, have made her an in-demand keynote speaker. You will be engaged, comforted and inspired by Shonda’s real-life stories. You will relate to her, cry with her, and laugh with her. The Friends of Williams PTO (which benefits students at the Williams Intermediate and Bridgewater Middle Schools) is hosting its annual Santa's Workshop on Saturday, December 8th, from 9am to 2pm at the Bridgewater Middle School (aka the old high school). 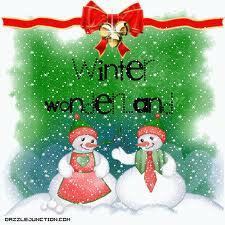 If you'd like information about reserving space at the holiday craft fair, please contact me at wendi@lacivita.com. If you know someone who might be interested in joining us, please feel free to pass along my contact information. The AAUW-MA (American Association of University Women) will hold its annual Fall Conference on Saturday, October 27th at UMASS-Dartmouth, from 8:00 a.m. to 4:00 p.m. The event will take place in the Advanced Technology and Manufacturing Center (ATMC) at 151 Martine Street, Fall River. This year's conference will focus on "Women and Politics" and will feature a panel discussion on voting rights, health and education issues, and House & Senate bills directly impacting women. Members of the panel are Mary Lu Bilek, Dean and Professor of Law at UMass School of Law; Melissa Cranford, Medical Student at Brown University; and Dr. Juli Parker, Director of the Center for Women, Gender and Sexuality, UMass Dartmouth and Co-Chair/founding member of Bristol County Commission on the Status of Women. In addition, participants will view Miss Representation, a documentary written, directed and produced by Jennifer Siebel Newsom. The documentary explores the under-representation of women in positions of power and influence in America. On Wednesday, October 10th, the Taunton branch of the AAUW (American Association of University Women) will meet in the Taunton Public Library Auditorium at 12 Pleasant Street, Taunton. 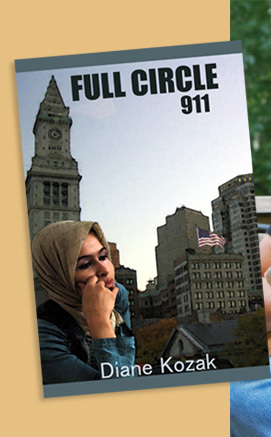 The meeting, which is open to the public, begins at 7:00 p.m.
Diane Kozak, local author of Full Circle 911 and the sequel, Exposing Eurabia, will be the guest speaker. Full Circle 911 is a work of fiction focusing on a Muslim teenager living in Massachusetts who uses her Islamic background to uncover some frightening connections between a series of recent terrorist attacks in Europe, and then discovers that her brother heads a terrorist cell. For more information about Diane and her writing career, go to www.dianekozak.com.